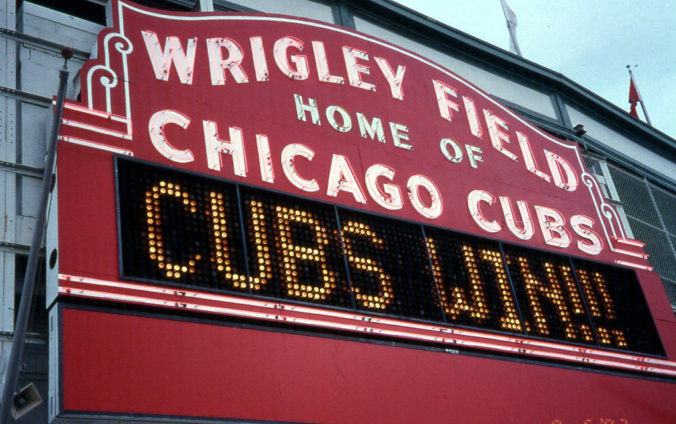 I was in Wrigleyville the night the Cubs clinched the NLCS championship. When my friend invited me to go I turned him down at first. It was a Saturday night and Sunday morning always comes early. I’m not really into crowds. Parking in that area was going to be a nightmare. But I realized that if they won it was going to be historic. We watched the game from the street. Stadium neighbors had turned their TVs to face outward. A bar had put a couple of large screens on its outside walls. We could hear the roars from Wrigley Field. The crowds inside and outside the stadium were willing the Cubs to win. With every run people high-fived each other. Strangers congratulated each other, grasping shoulders and giving pats on the back. We landed in a small Korean restaurant for the final innings. Sitting at tables around us were Hispanic, African American, and Asian fans and Chicago cops. A community of hopeful longing formed in our restaurant. When the Cubs won the whole restaurant lifted off the ground a few inches. People poured into the streets. There was no destruction. Only celebration. I’ve never experienced anything like it. I know it was only baseball, but it felt like a real Kingdom of God moment. We have a chance to come together in an even more meaningful way by giving to Hurricane Matthew Relief in Haiti. Our Bishop, Sally Dyck, and the Bishop of the East Ohio Annual Conference Tracy Smith Malone have challenged each other to a cross-conference rivalry to see which annual conference can raise the most money for Hurricane Matthew relief in Haiti. Click on the link below to give your gift, be sure to mark Northbrook UMC so that our conference gets credit. Invite friends to give too. Dare Cleveland fans. Let’s do all we can to let Haiti be the winner of the World Series! This is a great challenge and way for people to get involved! Plus, you know how competitive I am! How did you know the Cubs had won? All the people poured into the streets. I’m like Columbo that way.